Why Cold Brew? Cold Brewing Is 70% Less Acidic Than Hot Brewing. And Richer In Taste. Our Cold Brewer Extracts Coffee Concentrate Which Can Be Stored And Mixed With An Endless Variety Of Beverages To Create Your Own Perfect, Personal Cup Of Joy. 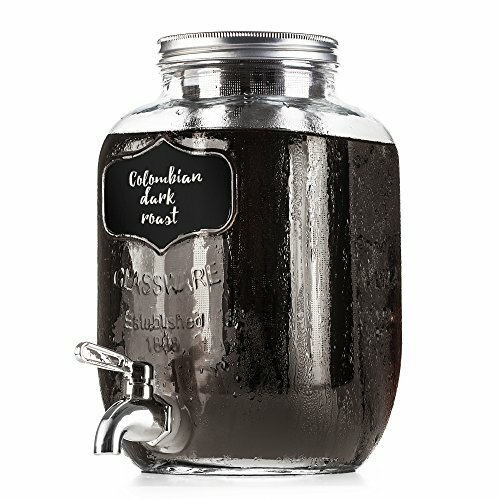 Why BTäT Cold Brew Coffee Maker? MASON JAR BASE: Durable And Reliable, Made Out Of Strong Soda-Lime Glass. It's Dishwasher Safe And Designed To Withstand Changes In Pressure And Temperature. 100% FULL LIFE-TIME WARRANTY: Btät Cold Brew Coffee Maker Is Designed To Make Cold Brew Coffee For You For Years But If It Doesn't Perform Up To Your Expectations, Let Us Know. You Are Covered By A Life-Time Replacement Guarantee.